Add a classic touch to your bathroom dicor with Globe Electric's Cameron 3-Light Chrome Vanity Strip. A perfect way to brighten your space, the reflective chrome finish acts like a mirror to enhance light output. Place the fixture vertically or horizontally to compliment your room in just the right way. Ideal for a bright Hollywood vanity set up, the Cameron 3-Light Vanity Strip works well alone, or by pairing it together, to create the perfect light for a vanity station. Create a time-honored old world look by adding any one of Globe Electric's designer vintage bulbs. Includes all mounting hardware for quick and easy installation and requires three medium based G-type bulbs (sold separately). Globe Electric's Finn 5-Piece All-In-One Bath Set is a wonderful way to update your bathroom with one easy step. Combining a modern refined vintage design with straight moern industrial lines, these pieces will update any space. Complete with a towel bar, towel ring, robe hook, toilet paper holder, and 3-light vanity fixture with square white glass shades in a modern and sleek chrome finish, your bathroom will look streamline and welcoming. Add a compatible dimmer switch to your vanity fixture to create a warm ambiance for a relaxing bath. While the pieces complement each other you can split this set up and use it throughout your home. The towel bar makes an excellent shoe holder. The towel ring would be great in your kitchen. The vanity light works above the fireplace. Think outside the box! Three medium base 60W bulbs are required and sold separately. 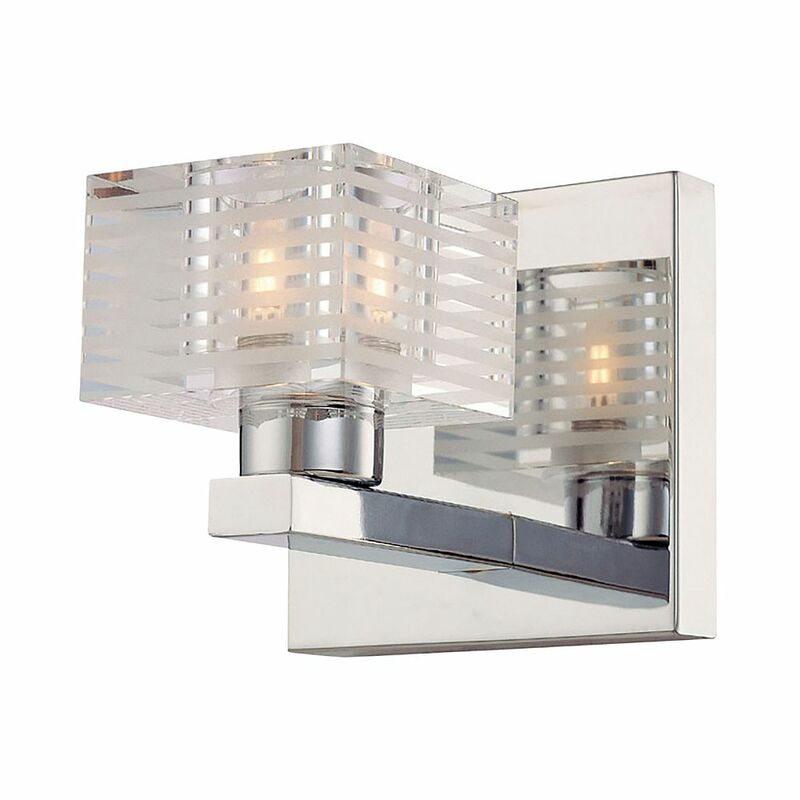 The 1-Light Chrome Vanity Light from Hampton Bay has a unique square shape and a bright chrome finish complemented by an etched glass shade. Featuring clean and simple lines, this fixture will give your bath or powder room a touch of sophisticated polish and an instant, elegant upgrade. Easy to install and easy to maintain, pair with other chrome pieces from Hampton Bay such as a faucet, towel bar or mirror for a custom look you will enjoy and friends will admire. Quatra 1 Light Vanity In Chrome And Clear Glass Give your bathroom a sense of sophistication with the etched crystal of Quatra. Our Quatra bath and vanity is available in chrome in one, two, three, and four light versions to fit in any bathroom space. For indoor use only.